Of the 3 wines below, which one was my favorite? I am not sure, depending on wine age and what I was eating then there was a place for all 3. The price range was double that of the average Scarce Earth Project Shiraz wine – so it would be up to you to determine if the wines were good value. As usual these wines are only available at the cellar door and there is a $5 flight charge for the tasting of the 3 wines. This wine comes from a part of a single vineyard. The vineyard is on the corner of Foggo Road and Kays Road and the grapes were situated on the higher rows that have their roots in shallow grey loam. The grapes were more de-stemmed than crushed with whole berries being foot crushed about two thirds the way through fermentation then transferred into new and old French oak plus old American oak. The name of the wine comes from bats that used to find their home in an old building on the property. The aromas started with red fruits that just seemed to jump out of the glass at my nose as it got closer to the glass. I went back to smell this wine a number of times and I got some smoky peatyness and pepper then, somewhat strangely, eucalyptus. When I tasted it there was a mouthful of tannic cherries that melted into a peaty mid palate. 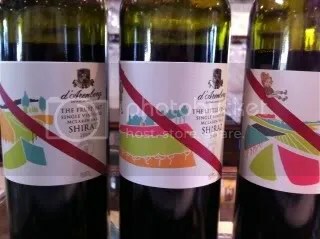 I am not sure this was typically McLaren Vale Shiraz but it was a typical d’Arenberg wine. From the same vineyard as The Fruit Bat, but from the lower (bottom of the hill) and has similar shallow soils. The difference here is there is a spring and thus provides plenty of water for the vines. This vineyard with plenty of water provides the reason for the wine name. Part of this vineyard has been transferred into biodynamic practices as part of d’Arenberg’s experimentation into vineyard improvements. The wine treatments are practically the same for The Fruit Bat Shiraz. What a difference from essentially the same vineyard! Here was aromas of plums with floral notes (maybe violets) some oak and cardamon pod spice hits. The flavors started with some fruit sweetness (maybe from the berries being crushed part way through fermentation) that went into a more intense cherry and plum profiles. The tannins were more chunky than The Fruit Bat – again so different for what was the same vineyard. Located on the original Osborne property near the winery, cellar door and restaurant complex, this vineyard is roughly shaped like a golf club and is said to be as wide as a good eight iron shot (not that I would know). The soils are grey loam over limestone. I understand that one cannot smell sweetness, but that is what I got straight away from this one. Dark plums are indicating more ripe flavors and what I can only describe as typically McLaren Vale Shiraz here. The mid palate length one expects with intensity of fruit and tannins. Also get a hint of crushed ants, which is typical of d’Arenberg. This entry was posted in Mclaren Vale, wine and tagged Australia, cellar door, d'Arenberg, Earth, Mclaren Vale, McLaren Vale Wine, Oak, scare earth project, Shiraz, Syrah, wine, wine McLaren Vale. Bookmark the permalink.